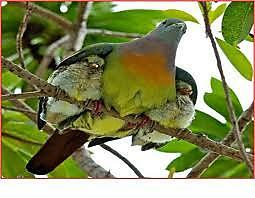 Psalm 91:4, “He shall cover you with His feathers, And under His wings you shall take refuge”. Insight: Why Didn’t I See This before? You may think that I learn all my lessons about Scripture before I present it on Sunday mornings. Actually, I’m kind of slow and have to hear much of God’s word over and over before it really sinks in! “This is one of the serious lessons which the history of the Jews in the time of Christ teaches us. They were exceeding zealous, as they thought, for God’s word and honor, and yet it turned out that all their zeal was for their human interpretation of God’s word. Jesus said to them: ‘Ye search the Scriptures, because ye think that in them ye have eternal life; and these are they which testify of me: and ye will not come to me that ye may have life.’ They did indeed trust to the Scriptures to lead them to eternal life; and yet they never saw that they testified of Christ, and so they would not come to Him. They studied and accepted Scripture in the light and in the power of their human understanding, and not in the light and power of God’s Spirit as their life. The feebleness of the life of so many believers who read and know much Scripture has no other cause; they know not that it is the Spirit who gives life; that the flesh, that the human understanding, however intelligent, however earnest, profits nothing. They think that in the Scriptures they have eternal life. But they know very little of the living Christ in the power of the Spirit, as their life. Remember the parable of the sower and the seed? What made the difference? It wasn’t the seed!!! It was the preparation of the soil! May God so work in us and may we so humble ourselves before Him that our hearts (not just our minds!) would be prepared to receive His word, every time we read Scripture! Because God’s word doesn’t bear fruit on a hardened or non-receptive or prideful heart! ... Even mine! Today in New Testament Survey we discussed Jesus’ trials and scourging before His death. It struck me that God often grants the Christian mercy and a sense of His presence during suffering, while Jesus was cut off from His Father. He bore God’s wrath and received no comforting presence as we do. Our suffering is never too much because God is always with us, controlling the circumstances of our lives and holding us up when we can’t stand. We often say that accidents happen. For the Christian, I believe there are no accidents. Last August 17th I injured my ankle, and that day held good intentions! Early in the morning I went on my walk with my dogs…they often walk me, but not this day. The dogs kept a steady pace, and I had in mind to make Brazilian potato salad and to practice my solo for Sunday. Also, I planned to work on a reorganization project that I had begun. Noticing a wet sidewalk ahead, I did not notice that it was also slick. Best-laid plans can go awry, and they did that day. I stepped on the wet sidewalk that was familiar and up in the air I went landing on the sidewalk at a 90-degree angle. It was no accident, as I soon found out. I sat there in shock for a moment, and noticed my ankle was turned in two different directions. Having no cell phone right then, I said, “Now what?” First, the dogs sat down on the sidewalk (not their normal) and just waited. Then the Lord brought someone along to help at that moment. An angel named Anne with the help of another unnamed angel took me and my dogs in her van, dropped my dogs off to my backyard, and took me to the ER to the very hospital where she also worked! Yes, Angel Anne was on her way to work, and told me that she just asked the Lord what she needed to do to help that day. From the hospital I was able to call my husband, who was out of town, and he asked two lovely angels in our church to visit me before surgery. They did – Bob and Carol Edelmann. As a result of the happening on Aug. 17th, family members that I had not heard from in quite a long while were back in touch. The Lord gave me opportunities to have a witness to hospital workers and gave my Angel husband the opportunity to put chaplain skills to work at home. The Lord is not only good, but He does all things well. Scripture ‘should’ challenge our hearts and minds as we pursue a deeper relationship with God every day, but I confess there are many narratives in Scripture that fascinate me from a ‘story’ perspective. One that always grabs me when I read it is the passage in John 8: 1 through 11 regarding the woman taken in adultery. The Bible clearly states that this was a setup to catch Jesus in a political crossfire. His accusers wanted to get him between the Law of Moses and His overt love for sinners. Yes, I remain fascinated by why only the woman was brought before him when the text tells us she was taken in ‘the very act of adultery’. Where was the man? How could her partner escape the same judgment? Why did the woman not publicly identify him? And, I am puzzled like most people regarding what He wrote in the sand. Those are questions that may or may not be answered in eternity. I know that if God had deemed it important for us, He would have given us those answers. What truly amazes me, however, is the statement Jesus makes right before all the accusers start leaving the mockery of a courtroom. After writing in the sand for a time, Jesus stands, looks around at the accusers (for a moment, try and put yourself in THEIR sandals!) and then makes an astounding statement: “He who is without sin among you, let him be the first to throw a stone at her.” It is an astounding statement only when we realize that He might not be addressing the sins of the accusers, but rather, making a profound statement about himself. It is obvious that the accusers got the picture about their OWN sinful condition; they left one by one, starting with the oldest, until no one was left but Jesus and the woman. Then Jesus asks the woman where her accusers are. She correctly states that there was no one there to condemn her. None, of course, except the One who created her, gave her life, and was preparing to give His own life to cover her sins. Jesus, the perfect one. So….. when Jesus says ‘let he who is without sin among you cast the first stone’, it is very possible that He was referring to Himself. He was, indeed, the only one among them who was without sin, and was, therefore, the only one who could judge the sin and the sinner alike. Jesus was among them and he was without sin. Jesus could have thrown the stone and condemned the woman; instead, He reached out to her and challenged her to walk no more in sin. The same sinless one stands as the advocate for all born again Christians today. He stands in front of all our accusers and makes the same statement to them – that He is the only one among them without sin, that He is the only one whose judgment is righteous, and He chooses not to cast the first stone. Instead, he touches our lives and challenges us to ‘go and sin no more’. And the truly amazing thing is that as we submit to the leading of the Holy Spirit, we can do so. COMMENT..........Nancy: I love our online insights from God’s Word! Keep this going!